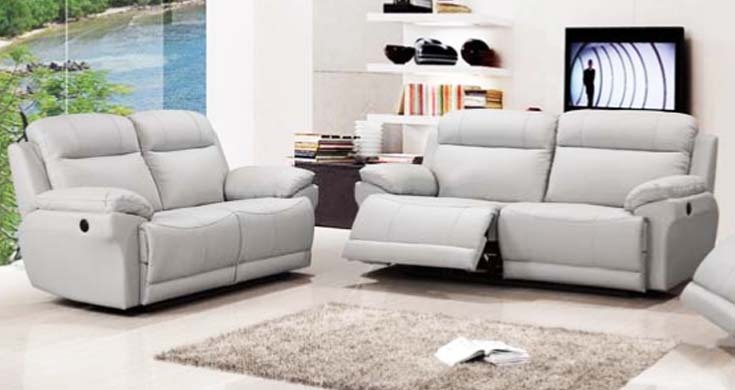 The Croydon electric recliner sofa set is made for relaxation. The luxurious electric recliner has high back and is power operated. It is available in a 3 seater, 2 seater and armchair, you choose the combination you require. Everyone knows that the sofa is not just about comfort these days but is also the focal point of your living room so the design is key to your room and we believe this sofa set is just right for you, its available in 3 colours, several combinations, one of them if not all will suite your living room. The sofa is available in grey, black or brown and the material is real leather to all wearing surfaces and premium bonded leather to little used surfaces like the very back of the sofa which is out of sight. Because we are proud of the quality we sell we offer 12 months warranty with all our sofas. Offering electric reclining functions which is operated by heat sensitive finger control switches and can stop in any position that suits yourself. For ease of access the backs detach so the sofas are easily transported into any room.